Thank you so much for being a part of our special day. The whole experience was wonderful – from answering our questionnaire, choosing vows and seeing our story come together during the ceremony. You offer something truly special from the traditional ceremony and we will remember this for our whole lives. Thank you SO much for today. It was perfect in every way. We honestly felt like we were adventuring with friends. You are such an incredible caring person who put so much into our day. Our only sadness is that we live so far away and won’t see you again. But we do wish and hope to visit this special place again one day in our future together. Thank you for being a part of the start of our journey as husband and wife. In the hustle after the wedding and the subsequent honeymoon, we never took the time to properly thank you for everything you did. The ceremony was perfect. We were flooded with compliments about how well you presented everything and the quality of the content. People toughed it out in the rain for us, and we still heard on numerous accounts it was the best ceremony people had ever heard. The wedding certificate and book you made of the ceremony content is something we are going to cherish forever. We can’t thank you enough for the massive contribution you made to our day. I want to say thank you so much for being part of this amazing weekend. I can’t tell you how many people came up to us to rave about the ceremony you wrote for us. The consensus was that no one has ever heard a ceremony so personal, so special and so true to who the couple are, as individuals and together. All I can say is it was raves all around. I hope your wonderful ceremony inspired some of our soon-to-be-married friends to seek out your services so that we can see you again in the future. Thank you again, it has been a pleasure. Thank you for making our ceremony the most special and memorable moment in our lives. You were able to take our words and make them into a perfect ceremony written just for us! You made the comment multiple times, that we are inspiring to you. What you don’t realize, is the you are inspiring to many. You have an ability to make people really think about their relationship, their life and who they are. You are able to make people feel ease, comfort and strength simply by your presence. You have a way with words that is elegant and meaningful. Barb, you are the person that was able to make our wedding exactly the way we wanted. Thank you for taking our guests on a journey through our relationship. You were able to explain and demonstrate to the most important people in our lives, who we are together. You inspire us to keep being the couple that you think is so great. Our vows that we made with your brainstorming help, will forever be reminders of the journey we took with you and our friends and family at the beginning of our married life together. Thank you, for making our day the best day of our lives. I just wanted to say thank you so much for our beautiful ceremony. We knew immediately that we loved it from the draft, but to actually hear it was another thing. You did so amazing, you are truly talented at your job. I cannot tell you how many people said it was the most beautiful and personal ceremony they had ever been to! Also, the little package that you have us with our ceremony was so beautiful and thoughtful. Thank you for taking the time to do that. I am so thankful that we found you and had you apart of our special day! We wanted to thank you so much for your gift. It was unnecessary but so incredibly thoughtful, touching and meaningful to us. We couldn’t possibly be any happier to have had you as our celebrant. Thank you. We would like to share with you what some of our guests experienced. We had guests come up to us immediately after the ceremony to tell us with tears in their eyes that our ceremony was the best they had ever experienced. Our parents noted how special they felt and how meaningful their acknowledgement was. People were asking where we had found you and where you were from. It was very clear to everyone that you truly do love what you do and how well you do what you do. You alone made such an impact on our day and we are overwhelmed with happiness. Thank you. Words cannot express how pleased we are with how the ceremony went. I have to email you, to tell you that countless numbers of our guests made similar comments throughout the day and continue to. Those are, “your ceremony was amazing”, “I have never cried so much in my life”, “you guys are an inspiration” and “this is the best wedding I have ever been to”. Barbara, without you, this would not have been possible. You were able to get us to think “outside the box” on our ceremony and create vows that were meaningful to us. People have commented on your sincere delivery of the ceremony and we are just so thrilled. Thank you also, for the package you put together for us of our ceremony, that is so special and will be a lovely reminder in the future. Thank you so much again, from the bottom of our hearts for helping make our wedding day so darn special! Everyone was just so impressed and we truly couldn’t have done it without you! From the bottom of our hearts we want to sincerely thank you for a wonderful ceremony and let you know how much we appreciated you leading us into marriage. You made our ceremony so meaningful and I have had countless friends and family tell me how beautiful it was. I loved how it had an informal, sentimental feel with a few laughs! We were on top of the world and I have never felt or been surrounded by so much love. You are right in that we have amazing family and friends who were right there, leaning in and supporting us! We are planting Lily (the lilac) this week and plan to take a photo with her each year on our anniversary. We will be sure to send you photos! Thank you for being such a big part to the start of our marriage. We are so happy! All the best and hope to see you sometime soon in Canmore. Thank you so much! I had so many people come up to me saying how unique the ceremony was! One of my friends said she loved how it was ‘new age’ and there was no ‘man on top’.. I can’t remember exactly what she said but she really appreciated it from a feminist point of view. You did an amazing job, so thank you so much for putting all that work into it- it was perfect! From the moment we spoke on the phone with you, we knew we had made the right choice. We wanted a unique ceremony that was very personal and you gave us that and so much more. All of our family and friends are still talking about our ceremony and how amazing it was, some even said it was the most meaningful and heartfelt ceremony they have ever seen. That was because of you and your care, your time, and your effort. You took our words and make it into something so very special. We enjoyed the process all the way through and we appreciate how much thought goes into what you do and your passion for your job. This is just a little something to say a huge thank you. This was made for you with love by our friend Laura. It is called the “wise one”, as the grey sapphires relate to teaching and wisdom and we thought that was very fitting for our experience with you and all that you have taught us along the way. Thank you! 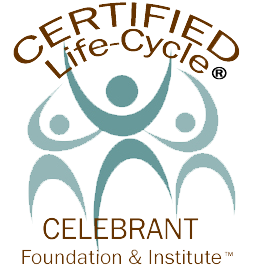 She is a dream to work with and offers couples so much more than a regular officiant. Steve and I already knew each other very well, but the work that Barbara made us do to prepare for our ceremony helped re-affirm for us why we were getting married. She created something for us that fit us to a tee. I recommend her to anyone who is seeking more than your standard run of the mill ceremony! Kathy and I would really like to thank you for such a beautiful ceremony. It was magical and we loved it. Many people have said wonderful things about it and asked us who the celebrant was. And thank you for the beautiful book of the ceremony. We plan to pull it out and revisit the ceremony on our anniversaries. I saw you up on the dance floor and it looked like you were having a good time. The DJ sure played good music. Once again our sincere thanks. The vows ceremony was very special thanks to you. Without a doubt, the best day of our lives! Thanks so much for creating such a heartfelt ceremony that spoke to who we are – we loved it and will cherish the words you printed for us! This is amazing, so much more what we wanted!!! My biggest fear is realized….I will be a huge bawl baby on the 16th!! Wow!! What a beautiful memory is etched in my mind for my daughter’s wedding ceremony. I knew it would be beautiful as it was in the mountains so such a breathtaking backdrop. What I did not expect was the ceremony was so meaningful and we were so much a part of it all. Thank you Barb for capturing the spirit and heart of both Angela and Andrew We were drawn into their story and it was more than just vows. Barb’s unique gift for not only writing their story but also her whole delivery was beyond words and something none of us had experienced at any other wedding. 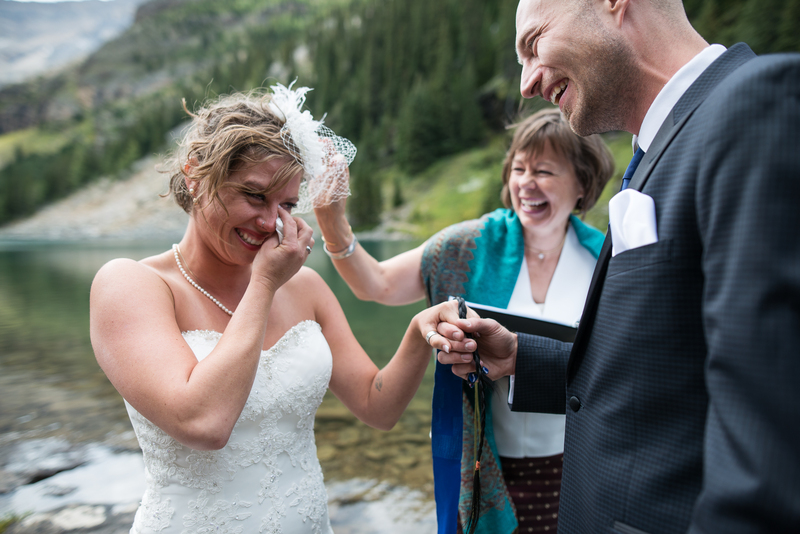 There were many happy tears and was a real gift to us as the parents of the bride. We’ve been having so much fun since yesterday recapping all of the things about the wedding that we loved so much and can’t stop grinning about how amazing the ceremony felt. It was absolutely perfect and we hope you know how thankful we are for all the effort you put into making it so. Here are a few pictures from our wedding. I want to thank you again for everything. You made our day that much more special and amazing. I honestly don’t even have the words to thank you or express how much we enjoyed the whole process. I truly believe you brought us even closer. Sitting down and thinking about how I can convey what you did for us feels like an almost a hopeless task. As I reflect back on Saturday and in particular, the ceremony, I can’t help but get a little emotional. I don’t say this lightly when I say that it was the single most beautiful, emotional, inspirational thing I’ve ever been apart of. I’m sure many people can say that about their own weddings, but I think we can agree that what we had was not a typical ceremony. All day and night people kept coming up to us and saying they have never seen a ceremony like that and how it was so beautiful and moving. Everyone loved how you spoke to the guests and included the parents in such a moving way. All I kept hearing from everyone – and I think I can speak for Vanessa as well – was how there wasn’t a dry eye in the crowd. I’ve never had so many grown men come up to me and tell me they were sobbing. Barbara you made our ceremony so unique and beautiful. We can’t begin to truly express our gratitude to you. You are an amazing women who is incredibly talented and creative. I will have a smile on my face and what feels like a golf ball in my throat from now on whenever I think back on Saturday. Thank you a million times. Thank you for helping us bring in so much intention and love into our wedding. It really was an incredibly special few days for us, and from the responses we have been getting from our friends family and guests, it appears it was quite special time for them as well. A few of our friends got some ideas of how they would like to have someone like you to help celebrate their unity. This speaks to the incredible work that you do…. Profound, authentic, and meaningful… Since our wedding day, our relationship has been strong and steady, more than it ever was before… we are closer in love. Also a big thanks to the love package we received, it presently sits on our treasured bureau and has been reviewed and loved at least once by each of us. So wonderful. The vows soon be displayed artistically in our room once we come to an agreement on how. Again thanks for everything, particularly the hours of work and intention perfecting the service. Hope this finds you healthy and happy in your well of magic. I just wanted to send you a note to let you know how beautiful you made yesterday for Jenn and Kev to have their happily ever after and share their wonderful story of commitment and love. We all left feeling we know them a little more deeply and dearly and our lives with be touched infinitely. Yesterday allowed me to revisit my vows from 11 years ago with my husband and celebrate all the reasons we chose to marry each other. Thank you for the work you do on the planet to inspire celebration! I have soo many good words to say about this woman I don’t know where to start. Thank you Barbara Parker. You made our wedding ceremony come to life, everything we envisioned. The words you used to express how we felt and what we wanted to share with our family was perfect. 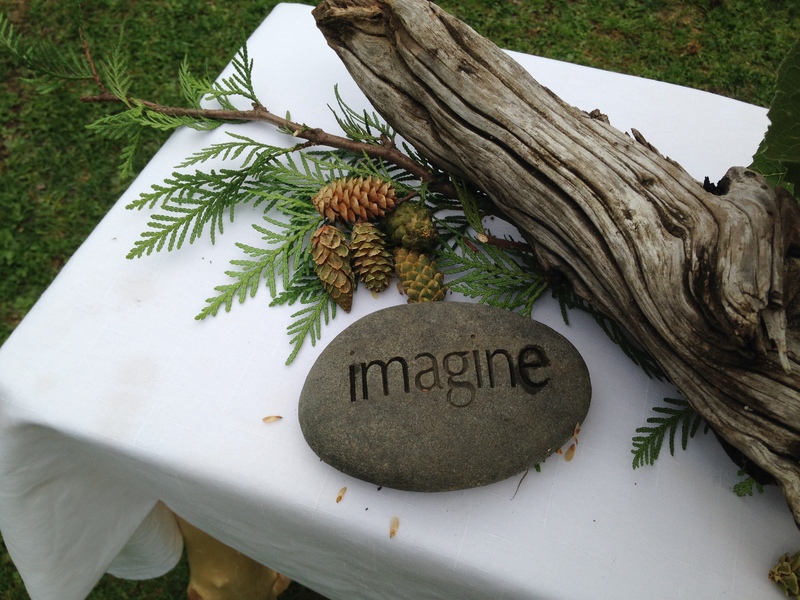 Barbara spent time customizing our ceremony to fit our wishes and incorporated a beautiful tree planting ceremony. She was very personal and warming, she even went out of her way to send us a personal email the day of our wedding. Our family is still talking about the ceremony, they even really enjoyed how she engaged them to participate. On behalf of Devin and myself, thank you so much for being a part of our wedding day. Not only did you completely save the day by agreeing to help us at the last minute when plans with another officiant fell through, but you gave us a ceremony that was incredibly personal and so touching….something we didn’t even know that we wanted! We had so many people come up to us and say how beautiful the ceremony was, and my mom even said it was like you had known us for years. Thank you for all of the work you did in preparing it and of course for being there with us on that very special day. We wouldn’t have wanted it any other way. Thank you so much for acting as our officiant to our wedding. We couldn’t have asked for a better ceremony. It was thoughtful, spiritual, and above all, “completely us”. Our family is still gushing about the wedding ceremony and we both feel that the memories will not fade. We just wanted to thank you again for such a great ceremony! EVERYONE was raving about it! 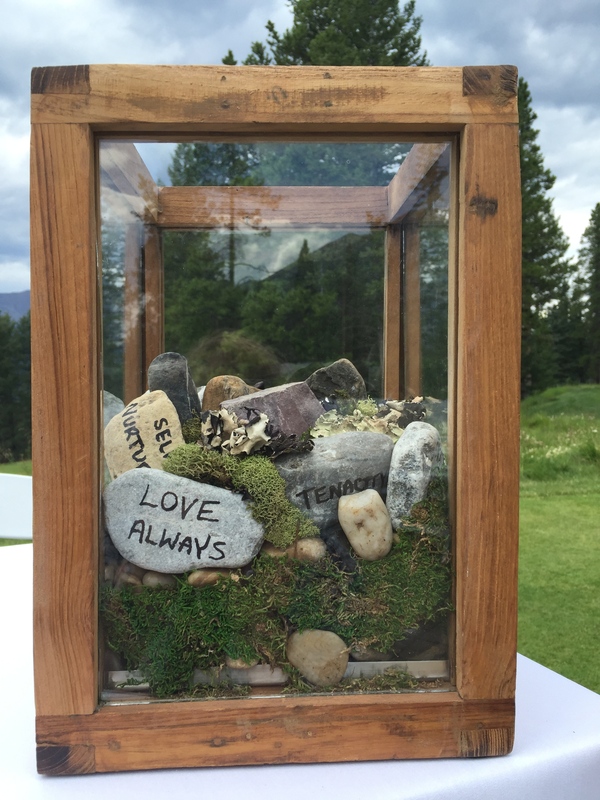 They loved the box idea, how personal it was, the vows and how well you spoke to everything. Many of our guests told us that it was the best wedding ceremony they have ever been to! Thank you again for making our day so amazing! Jacqueline and I would like to pass on our sincere gratitude for the part that you played in our Wedding Day. It is a cliche, but we just had a brilliant day and you played a significant part in this success. Thank you so much, we’d love to keep in touch. All I have to say is.. WOW!! This ceremony is more than I could have ever wished for… you truly brought together everything that is important to Jason and I and touched on it all perfectly… I am speechless! Jason and I read through it last night and it certainly brought up a lot of emotions, we are so pleased with how it turned out. 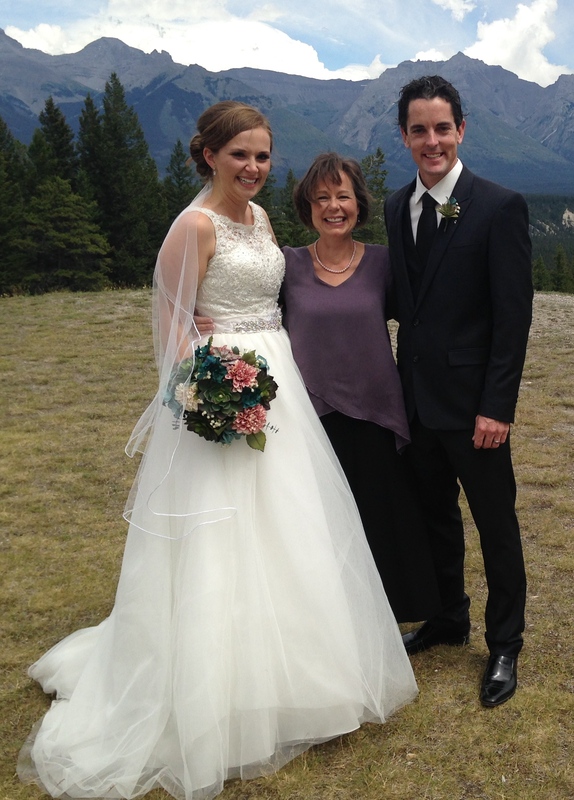 We were married this past Sunday in Canmore with Barbara as our Celebrant. 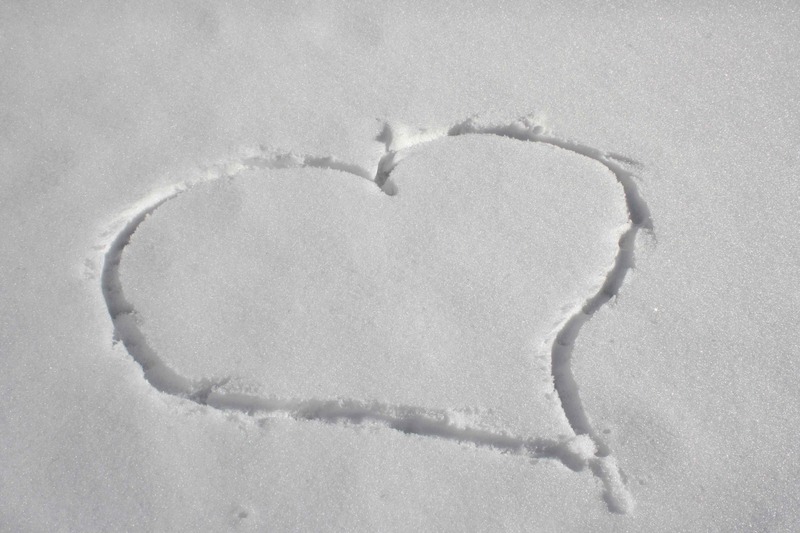 We were suggested the services of a Celebrant over a Marriage Commissioner for the heart and love felt during the ceremonies rather than a feeling of a contractual agreement. Barbara met us and went over our wants, needs and hopes for our wedding day and made us a completely customized ceremony to be remembered forever. She even included my Chinese heritage in honour of my family as well as the promise behind a sapphire engagement ring! So many of our family members and friends told us it was the BEST ceremony they’ve ever witnessed, and of course we agree. Barbara has a lovely and warm voice meant to carry the lovely and heart-felt notes of a marriage ceremony and what it represents. Thank you Barb for being the lady to bring our families together officially, we wouldn’t have had it any other way for our perfect day. Friends, Family, Forever! That was what our ceremony and day was to be based around. And fortunately for us, we were blessed to have met the only officiant to have created that. 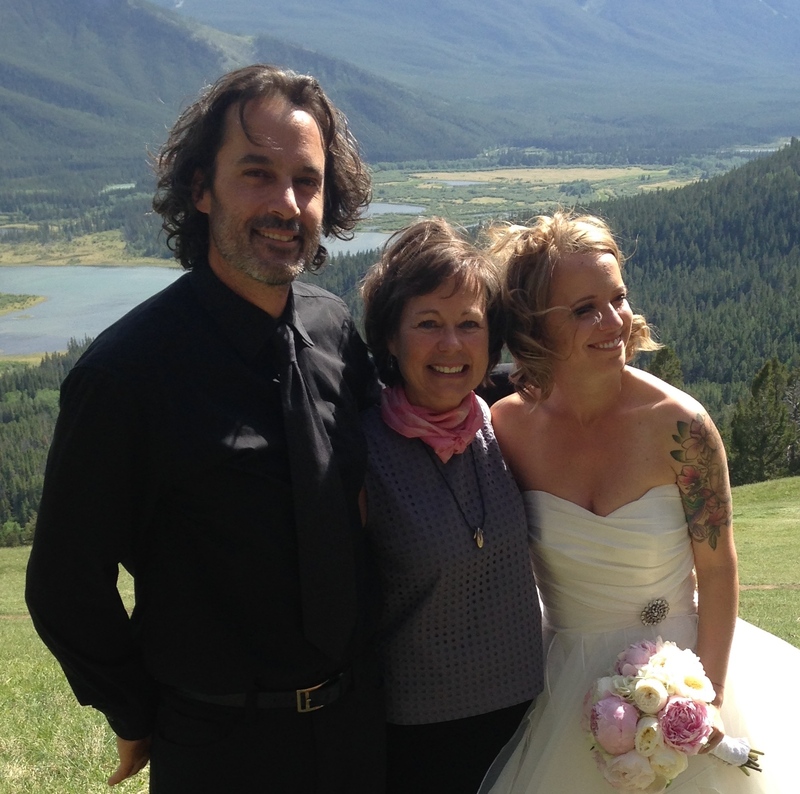 From the first time we met Barb in Canmore, we knew she was the one to write our Love Story. And what a Story she wrote. The entire process brought us together as a couple even more than we already were. This was accomplished from the reflections we answered about ourselves and each other from the first draft through to the final story. Barb absolutely understood us as a couple and as individuals and put so much passion and spirit into every word of that hour. Working with her in person and over email was something we both looked forward to. Barb even went the extra mile by allowing our best friend Brenda to work along side with her during the ceremony. These two women worked beautifully together creating a unique, intimate and emotional ceremony. Barb suggested elements to add in our day that spoke to us as individuals. Traditions from both sides that we were unaware of right through to the unity ceremony that we would have never even entertained on our own. Barb absolutely “got us”. And all this was just from one meeting of questions and from the reflections we wrote. Our intent was to engage our Friends and Family in our sacred moment. And from the pictures and videos, everyone was feeling the love we both felt that day. The smiles and laughs on their faces and the tears in their eyes proved they shared in our love and joy. The context, the detail and her delivery coupled with the mountains created a space that is really beyond description. Barb created a moment of community, a ceremonial space in bringing us together as a married couple. It is valuable to point out that we continuously hear what a unique and captivating ceremony they witnessed. These comments even came from those that attend many weddings, such as our DJ, photographer and our venue manager. We received and still are from guests, how the bar was raised on wedding ceremonies. Barb is now in our circle of Friends and Family. How lucky are we!! I can’t thank you enough Barbara for the service you delivered and for the healing you gave to all of us. The time you spent with us recollecting was invaluable in our process. I had almost everyone at the funeral approach us and say it was the most memorable funeral that they have ever attended and I believe much of that is due to you. One relative said that you brought our mom into the room I know that was your intention. Thank you also for encouraging me to share my poetry. It was special to bring that to the family. Thank you so much for your kind words. The rest of our holiday was indeed memorable and refreshing – just what we needed to take it all in and reflect upon the commitment we made to each other. Both Misha and I were so glad that you were here to help create such a heartfelt, meaningful ceremony. It was without a doubt the highlight of our trip. Your idea for moving the ceremony from one destination to the next was so thoughtful, and symbolized our journey so wonderfully. And thank you again for the lovely ceremony keepsake! We plan to begin a tradition of reading through our vows on every anniversary. It will be a treasured keepsake and memory. We couldn’t have done it without you. I know that Sonya and Perry are over the moon at what you created for them to show their love story and expressing who they are and the union of marriage and agreeing to let me have a large part. You made it seem so streamlined, flawless I could not have done my part without your guidance and supporting me. You are a great speaker – you engaged the crowd you had their attention at the word Welcome and that gave me such a boost when I first had to speak!! We’re still hearing about how much people loved it. I can’t count the number of people who have told us that was the best ceremony they’ve ever attended. It was truly memorable for us, our families, and friends. Everyone loved how much effort you put into it to make it personal, and about us. Thanks again for the amazing job you did at our ceremony. I wanted to thank you again. 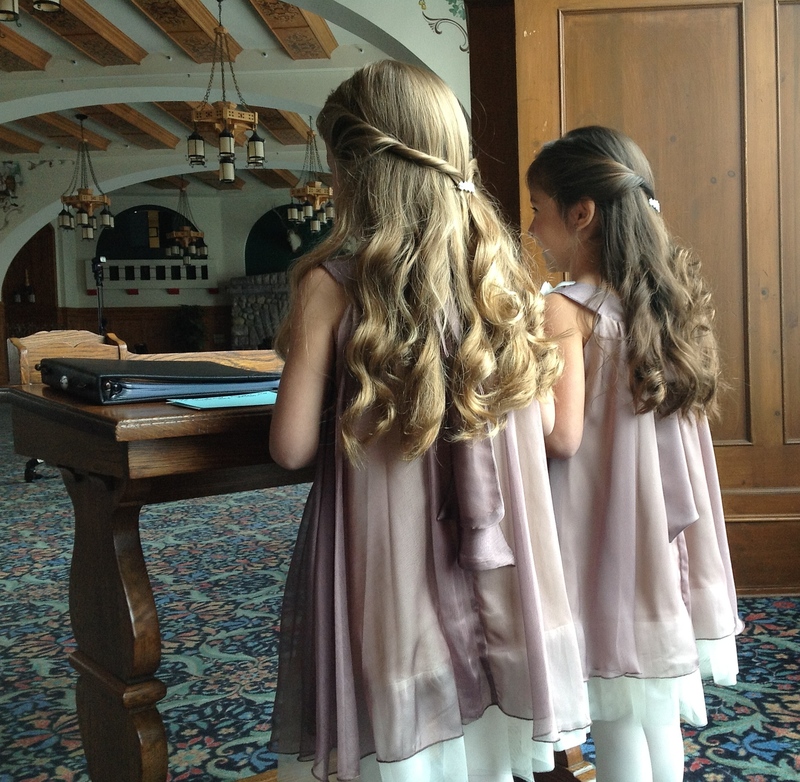 We heard from so many family and friends ours was the best wedding they had been to, so beautiful and meaningful. Your work really made our wedding. Your suggestions, insights, taking the time to craft our ceremony with participation of our closest family, and our story, and a beautiful presentation. I will be happy to provide a glowing reference if any couple would like to know more about your work. Neal and I are beyond pleased with your services. I just love that Handmade book you gave us – a lifelong keepsake for sure! Thank you for all your kind words, you made our dream come true and we couldn’t have picked a better person to bring it all together. You will forever be in our thoughts. What a magical day it was. Numerous guests told us it was the most beautiful and personal ceremony they’ve ever been to! Thank you so very much for everything you contributed to our day. We were both so proud to share the ceremony with our families, it was easy to feel present when you took such care to make the ceremony ours. A little note to reiterate how lucky we were to have you on board last june, 2012. Not only were you the rock and key figure, helping us beyond what words can describe, going through the ordeal of burying a best friend who lost his life in a very untimely accident; your obvious empathy and compassion meant the world to all of us in the darkest times possible in a human life. But also your experience in the matter, and your professionalism allowed our whole group to give our departed buddy a wonderful, touching and genuine farewell. You helped us focus, and guided us with the right frame of mind, to build a very nice ceremony, to which the ones who participated were just able to each add their personal touch and testimonies. Without you the funeral would not have been half as nice as we wanted it to be. As well, I personally really appreciated the non-religious but spiritual metaphores (lighting of the candles etc…) and analogies that filled this special time, in a spirit that I know Arnaud would have appreciated. His family sure was amazed despite the pain. Thanks again, I know you are the best advisor anyone could hope for.